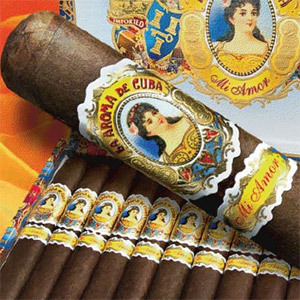 Coming from a long cigar legacy, which began early in the 20th century, the La Aroma De Cuba Cigars brand is distributed by one of the leading cigar manufactures in the cigar business. If you haven’t guessed it already, the manufacturer that was alluded to was Ashton cigars. Fact: La Aroma De Cuba cigars were one of Winston Churchill’s favorite cigars. Whether you choose the La Aroma De Cuba EE, La Aroma De Cuba Mi Amore, and/or the La Aroma De Cuba New Blend cigars, know that they are all made using only the best Nicaraguan tobaccos available and are blended by the master Don Pepin Garcia.